Professor George Matheron did! How many geostatistocrats knew that he was the mastermind behind the novel science of geostatistics? Dr Frederic P Agterberg was another mastermind. I’ll need more time to report what he has been writing. 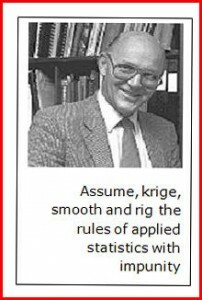 Of course, it makes no sense to krige, smooth and rig the rules of applied statistics with impunity! Invariably, I test for spatial dependence between measured values in ordered sets by applying Fisher’s F-test to the ratio between the variance of the set and the first variance term of the ordered set! That’s why applying the F-test makes sense. The more so because Dr Roussos Dimitrakopoulos is not yet teaching his students at McGill University why degrees of freedom ought to be counted! Professor Dr Michel David had been awarded Grant 7035 by the National Science and Engineering Council of Canada. Good grief! Why does NSECC not respond to questions? Geostatistics for the Next Century? An International Forum to honour Professor Dr Michel David for his contribution to geostatistics? What’s this world coming to! I read David’s 1977 Geostatistical Ore Reserve Estimation after Elsevier had published it. David’s work has never been a part of any ISO Standard. Yet, ISO Standards have been my bread and butter since I joined ISO/TC102 – Iron Ore in 1974. ASTM’s Board of Directors has awarded me in 1995 for continuous membership of Section 5 Petroleum Products, Lubricants and Fossil Fuels. Tracing geostatistics to its roots in applied statistics is simple comme bonjour. It’s about as simple as to create spatial dependence where it does not exist! What a pity that interpolation between measured values does not give unbiased precision estimates for grades and contents! Stripping variances off distance-weighted averages AKA kriged estimates has made no sense at all in my work. Professor Matheron in 1970 put in place Brownian motion along a straight line! Good grief! Professor Dr Michel David showed in Fig. 203 on page 286 a set of measured values with df=8 degrees of freedom. He pointed out that his 1977 textbook is not for professional statisticians. I do agree! Dr R A Blais and Dr G Perrault were not surprised that distance-weighted averages had metamorphosed into kriged estimates. The National Research Council of Canada kept Grant NRC7035 coming in convenient increments. Professor Dr Michel David’s 1988 Handbook of Applied Advanced Geostatistical Ore Reserve Estimation added another 216 rambling pages. Geostatistics converted Bre-X’s bogus grades and Busang’s barren rock into a massive phantom gold resource. Applied statistics proved the intrinsic variance of Bre-X’s gold to be statistically identical to zero. Are geostatistocrats still marching in place? It would have made sense to unravel what was wrong with Bre-X in 1993 rather than stringing Markov chains in 2014! All events at Montreal, Quebec, Canada took place on June 3-5, 1993. Practitioners of geostatistics had flocked from far and wide to praise Professor Dr Michel David. He had completed in 1977 what was called Geostatistical Ore Reserve Estimation. Scores of geostatisticians were driven to assume spatial dependence between measured values in ordered sets. The more so since a few samples selected at different positions in a finite sample space do give infinite sets of distance-weighted averages AKA kriged estimates. Professor Matheron’s new science of geostatistics was based on selecting a subset of any infinite set of kriged estimates, and on smoothing pseudo kriging variances to perfection. Assume spatial dependence between measured values, interpolate by kriging, smooth a lot, think a little, and rig the rules of mathematical statistics with impunity. Common sense dictates that testing for spatial dependence between measured values in ordered sets ought to precede interpolation by kriging. The more so since the variance has been stripped off each and every distance-weighted average AKA kriged estimate. Why work with an ordered set of kriged estimates and derive a semi-variogram? Why not work with an ordered set of measured values and derive a true sampling variogram? David’s 1977 Geostatistical Ore Reserve Estimation is the worst textbook on this planet. Until David’s 1988 Handbook of Applied Advanced Geostatistical Ore Reserve Estimation came along and made it worse! It’s simple to create spatial dependence where it does not exist. What a pity that interpolation between measured values does not give unbiased precision estimates! Stripping variances off distance-weighted averages AKA kriged estimates made no sense at all in my work. Professor Matheron in 1970 put in place Brownian motion along a straight line! Good grief! Professor Dr Michel David showed in Fig. 203 on page 286 a set of measured values with df=8 degrees of freedom. He pointed out that his 1977 textbook is not for professional statisticians. I do agree! Dr R A Blais and Dr G Perrault were not at all surprised that distance-weighted averages had metamorphosed into kriged estimates. The National Research Council of Canada kept Grant NRC7035 coming in convenient increments. Professor Dr Michel David’s 1988 Handbook of Applied Advanced Geostatistical Ore Reserve Estimation added another 216 rambling pages. Here’s a take on his 1988 Handbook of Advanced Geostatistical Ore Reserve Estimation. It was geostatistics that converted Bre-X’s bogus grades and Busang’s barren rock into a massive phantom gold resource. Applied statistics proved the intrinsic variance of Bre-X’s gold to be statistically identical to zero. How many geostatistocrats are still marching in place? It would have made more sense to unravel what was wrong with Bre-X in 1993 than stringing Markov chains in 2014! Professor Matheron’s new science of geostatistics was based on selecting a subset of some infinite set of kriged estimates, and on smoothing pseudo kriging variances to perfection. Assume spatial dependence between measured values, interpolate by kriging, smooth a lot, think a little, and rig the rules of mathematical statistics with impunity. 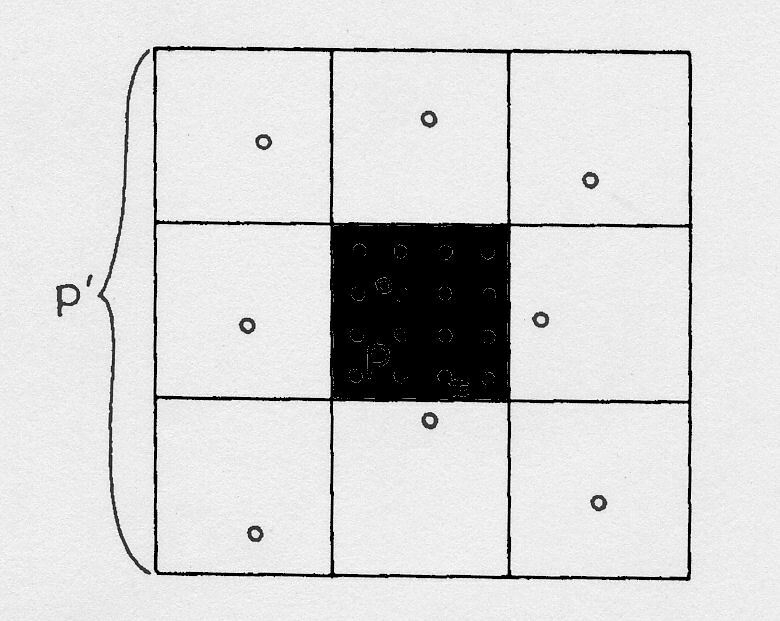 Common sense dictates that testing for spatial dependence between measured values in an ordered set ought to precede interpolation by kriging. The more so since the variance has been stripped off each and every distance-weighted average AKA kriged estimate. Why work with ordered sets of kriged estimates and derive semi-variograms? 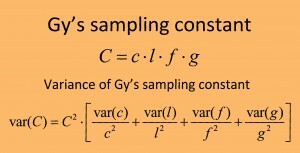 Why not work with ordered sets of measured values and derive real sampling variograms? Why not count degrees of freedom of ordered sets? David’s 1977 Geostatistical Ore Reserve Estimation was the worst textbook on this planet. Until his 1988 Handbook of Applied Advanced Geostatistical Ore Reserve Estimation came along and made a worse read! The Prospectors and Developers Association of Canada (PDAC) approved the above title in the 1990s. It did so to set the stage for a seminar at the Royal York Hotel, Toronto, Ontario for Saturday, March 23, 1991. I was tickled pink to be the first speaker. My textbook on Sampling and Weighing of Bulk Solids had been translated into Mandarin. I had asked for a royalty but ended up with a cup of green tea! The interleaved sampling protocol had been tested and was incorporated in several ISO Standard Methods. Professor Dr Michel David took a seat close to where I stood behind a lectern. He may have listened but posed no questions. He had studied how Matheron’s new science of geostatistics should be put into practice! Matheron and his disciples had done so by stripping the variance off the distance-weighted average and calling what was left a kriged estimate. Infinite sets of distance-weighted averages AKA kriged estimates and zero kriging variances metamorphosed into the heart and soul of Matheron’s new science of geostatistics. So much so that the world’s mining industry embraced his novel science with reckless abandon. All I did was prove the intrinsic variance of gold at Bre-X’s property to be statistically identical to zero. But it did take a sound grasp of the properties of variances! I have kept David’s 1977 Geostatistical Ore Reserve Estimation and Volk’s 1958 Applied Statistics for Engineers side-by-side on a bookshelf. Dr David didn’t know how to derive unbiased confidence limits for contents and grades of reserves and resources. What’s more, David did not know how to test for spatial dependence between ordered sets of measured values by applying Fisher’s F-test to the variance of the set and the first variance term of the ordered set. In Table 1.IV on page 25 Dr David pointed to the chi-square distribution for copper grades at Prince Lyell. David’s Index should have but did not refer to degrees of freedom on page 358. He should have listed degrees of freedom between deflected holes and density. Neither Professor Matheron nor any disciple such as Professor Dr David grasped how to test for spatial dependence between measured values in ordered sets. Elsevier Scientific Publishing Company printed the First Edition of Geostatistical Ore Reserve Estimation in The Netherlands in 1977. Reprints were distributed in 1978, 1979 and 1982. None showed how to test for spatial dependence between ordered sets, or how to derive unbiased confidence limits for metal contents and grades of ore reserves. David cautioned that “… statisticians will find many unqualified statements…” and that “… it is not a book is not for professional statisticians…” Did he ask professional statisticians to show him how to test for spatial dependence and how to count degrees of freedom? Did David know how to derive unbiased confidence intervals and ranges for metal contents and grades of reserves and resources? Here’s what Professor Dr Michel David revealed in his Introduction: “The financial help of the National Research Council of Canada (Grant NRC7035) is gratefully acknowledged as well as the opportunity to use the drafting facilities of the department of Mineral Engineering at Ecole Polytechnique.” One more contribution of Professor Dr Michel David to the evolution of Professor Georges Matheron’s science of geostatistics surfaced in his 1988 Handbook of Applied Advanced Geostatistical Ore Reserve Estimation. The author explicates: “This work was produced at Ecole Polytechnique de Montréal and its services are greatly appreciated. Many of the results presented were obtained in the course of research funded by the Natural Science and Engineering Research Council of Canada (grant 7035)”. Dr Roger A Blais, CC, OQ, MSRC, played a pivotal in keeping grant 7035 coming. I was left to unscramble the Bre-X fraud after geostatistical software had converted Bre-X’s bogus gold grades and Busang’s barren rock into a massive phantom gold resource. And I did! William Volk in his Preface pointed out that his take of applied statistics is traceable to a course he had taught in 1951. The McGraw-Hill Book Company published the first print in 1958. Its frontispiece reads: “for Dorothy whose confidence is without limits”. What a touching view on confidence without limits! I bought my first copy in the 1960s when I was working in the Port of Rotterdam. I have placed Jan Visman’s 1947 PhD thesis on coal sampling and William Volk’s Applied Statistics for Engineers side-by-side on the same bookshelf. I have tried to find out more about Volk after we had come to Canada in 1969 but to no avail. 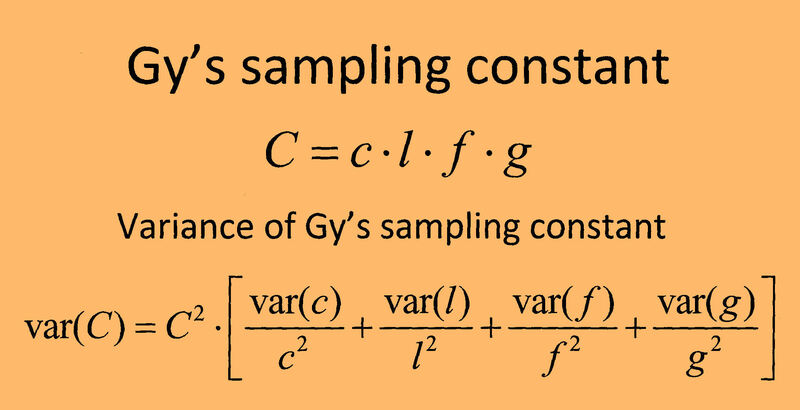 I wanted to write a Wiki page about Volk, his textbook, and his grasp of variances as displayed in Section 7.1.4 Variance of a General Function and in Section 7.3 Confidence Range of Variances. I still wonder whether or not Volk was of Dutch decent. It was fortunate to have met Jan Visman and Greg Gould on ASTM Coal and Coke. I found out the hard way that TUDelft did not teach Visman’s take on coal sampling. I have learned most about Visman and his sampling theory after he went from Ottawa to Edmonton. I wrote a Wiki page about Dr Jan Visman and his work. His sampling theory underpins the interleaved sampling protocol. It was readily accepted for mineral concentrates simply because it gives a single degree of freedom for each sampling unit. ASTM recognized me for 25 years of continuous membership in 1995. Good grief! All I really did was do what I like to do! The more so since Matheron’s curse of his novel science of geostatistics had not yet impacted my work. On a trip to Australia I lost a copy of Volk’s Applied Statistics for Engineers. What’s more, Australian customs confiscated my bag with red and white beans. I knew a bit about toads and rabbits but never thought red and white beans were as bad. I used my beans to prove that large increments give a higher degree of precision than small increments. Simple comme bonjour! Testing for spatial dependence between measured values in ordered sets was straightforward with on-stream analyzers. When Volk wrote about the power of Student’s t-test to detect a bias, he showed how to derive Type I errors and Type II errors. I have taken to talking about Type I risks and Type II risks. Gy’s 1979 Sampling of Particulate Materials and Volk’s 1980 Applied Statistics for Engineers still stand side-by-side on the same shelf. Gy had mailed me a copy with his compliments and his invoice on Christmas 1979. Elsevier Scientific Publishing Company has released it as Part 4 in Developments in Geomathematics. Part 1 is Agterberg’s 1974 Geomathematics and Part 4 is David’s 1977 Geostatistical Ore Reserve Estimation. Missing in Gy’s textbook between degenerate splitting processes and degree of representativeness are degrees of freedom. Gy points in Section 31.3 on page 381 to “a Student-Fisher’s t distribution with ν=N-1 degrees of freedom (DF)”. Gy was almost on the mark. His wordy gems struck me as Gy’ologisms! His references to Matheron’s new science of geostatistics are beyond the pale. Next to Gy’s 1979 Sampling of Particulate Materials, Theory and Practice on the same shelf stands David’s 1977 Geostatistical Ore Reserve Estimation, Journel & Huijbregts 1978 Mining Geostatistics, Clark’s 1979s Practical Geostatistics, and Mandel’s 1964 The Statistical Analysis of Experimental Data. What Matheron and his disciples cooked up at a geostatistics colloquium on campus of The University of Kansas, Lawrence on 7-9, 1970 will not stand the test of time. Matheron conjured up Brownian motion along a straight line. His disciples stripped the variance off the distance-weighted average and called what was left a kriged estimate. Infinite sets of variance-deprived kriged estimates and zero kriging variances added up to the genuine scientific fraud of geostatistics. Put it on paper; call it a PhD thesis; get it approved! Simple comme bonjour, n’est-ce pas! But the PhD supervisors at Université de Paris Sorbonne did not approve Professor Georges Matheron’s PhD thesis. On the contrary, they wanted to know what I have wanted to know for a long time! The title of Matheron’s thesis was “Les variables régionalisées et leur estimation: une application de la theory des fonctions aléatoires aux sciences de la nature”. How about that? Thank goodness French was my very first foreign language! How did Matheron test for spatial dependence in sample spaces and sampling units? He never did! That is why Matheron got stuck on the very first page of his PhD thesis. He didn’t know in 1965 how to test for spatial dependence between measured values. His PhD supervisors had posted on his thesis two (2) sets of whole numbers with the same central value. One set was ordered and the other was randomly distributed. Matheron’s PhD thesis added up to 301 pages of dense text and scores of symbols. But his PhD supervisors deemed it not enough to merit a PhD in his novel science of geostatistics! It’s rather silly that the Creator of Geostatistics and the Founder of Spatial Statistics did not know how to test for spatial dependence between sets of integers. But why didn’t he know? Applying Fisher’s F-test and counting degrees of freedom have never been part and parcel of his novel science. His failure to test for spatial dependence was part and parcel of what he fondly called his new science of geostatistics when he took it to North America in June 1970. Professor Georges Matheron came with his most gifted disciples. Neither knew how to test for spatial dependence by applying Fisher’s F-test to the variance of a set and the first variance term of the ordered set. His disciples believed Matheron was teaching a new science. His PhD supervisors were aware that his new science was an invalid variant of applied statistics. Matheron’s thinking was alive in the eyes of his disciples. He had always taught that a distance-weighted average AKA a kriged estimate does not have a variance. How about that? Strip the variance off the distance-weighted average and call what’s left “a kriged estimate”. Good grief! Distance-weighted averages have variances but kriged estimates no longer do! D G Krige had not come all the way to Lawrence, Kansas. M David and A G Journel were busy writing textbooks about Matheron’s novel science. A colloquium took place on campus at the University of Kansas, Lawrence in June 1970. D F Merriam, Chief of Geologic Research, Kansas Geological Survey, kept a record and Plenum Press put it in print. No list of visitors was kept. The event was useful to those who do work with applied statistics. Koch and Link, the authors of Statistical Analysis of Geological Data, talked about their work. Part I was published in 1970 and Part II came along in 1971. Both the famous Central Limit Theorem and the concept of Degrees of Freedom are still alive in Koch and Link’s work. I have had copies of both parts since the 1970s. I have used a data set in Sampling and Weighing of Bulk Solids. Tukey’s WSD test has also played a role in my work. Some Further Inputs describes what Professor Dr J W Tukey had seen in real time at Lawrence, Kansas. He wondered what would happen in two-dimensional sample spaces. Good grief! I was already working with three- dimensional sampling units and sample spaces. Marechal and Serra’s Random kriging and Matheron’s Random Functions and their Application in Geology had both been cooked up either at the Centre de Géostatistique or at Centre de Morphologie Mathématique. The variance had been stripped off the distance-weighted average and the concept of degrees of freedom was dismissed. Why did the geostatistical mind have distance-weighted averages morph into kriged estimates? The odd geostatistocrat may still remember the “famous Central Limit Theorem”. All it would have taken is a passing grade in Statistics 101. Matheron talked about Random Functions and their Application in Geology. He set the stage with a bizarre paradigm of Brownian motion along a straight line in deep time. It made counting degrees of freedom an exercise in extreme futility. Those who would have been tempted to count them would have scored a failing grade on Geostatistictics 101. Ranked high among vagaries in Matheron’s take on spatial dependence was his reference to the “quasistationarity” condition! Good grief! 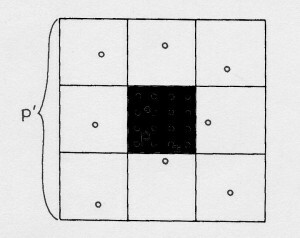 A facsimile of Marechal and Serra’s Figure 10 is given in David’s first textbook as Fig. 203 on page 286 in Chapter 10 The Practice of Kriging. The National Research Council of Canada has given generous support to David’s imperfect thinking. It did so with its Grant NRC7035. NRC did not engage in statistical quality control in those days. NRC has a new name but approves Markov chains. So much for SQC! The methane gas explosion at the Westray Mine in Plymouth, Nova Scotia, Canada on May 9, 1992 caused the death of 26 miners. Mine managers Gerald Philips and Roger Parry were charged with manslaughter and criminal negligence causing death. The mills of justice ground to a halt when the Crown had failed to give full disclosure of all of its exhibits by November 15, 1994. Mr Duncan R Beveridge, QC, with Beveridge, Lambert & Duncan, called during the summer of 1999 to find out what I knew about sampling and statistics. I pointed to Sampling and Weighing of Bulk Solids, my activities on ISO Technical Committees, and my savvy in solving scams such as the Bre-X fraud. I transmitted a facsimile of my curriculum vitae which was similar to the one currently posted on my website. I went to work on the Westray file shortly after October 1, 1999. It consisted of twenty–two (22) pages of text and ten (10) schedules marked A to F. I was pleased with the description of how post-explosion samples had been taken. Test results determined by Canmet and other participants in an interlaboratory test program were statistically identical. The Nova Scotia Department of Labour and the RCMP had selected test samples at intervals of 0.9 m in accordance with the Coal Mines Regulations Act. Test results for all test samples proved the average percentage combustible matter to be significantly higher than the maximum allowable limit of 35%. My report is titled Post-Explosion Sampling Procedures at the Westray Mine and was submitted on November 2, 1999. What piqued my interest was the testimony of Andy Liney, PEng and a former mine manager and ventilation specialist from the United Kingdom. He testified that too few post-explosion samples had been taken to obtain a precise estimate for the average percentage combustible for all locations. Post-explosion samples had been taken at 0.9 m intervals. A statistical analysis of test results in samples taken by the Nova Scotia Department of Labour and the RCMP proved beyond reasonable doubt that the average percentage combustible matter in the underground workings at the Westray mine exceeded the maximum allowable limit of 35%. Spatial dependence between measured values in ordered sets such as those taken after the explosion at the Westray Mine may or may not exist. As a matter of fact, testing for spatial dependence plays a key role in sampling practices for mined ores and mineral concentrates as defined in ISO Standards. The lead prosecutor was Herman C Felderhof. He knew as much about testing for spatial dependence at the Westray coal mine as did John B Felderhof at Bre-X’s gold project. On-stream analysis of slurries in mineral processing plants became a powerful tool in the 1980s. That’s why I put together Simulation Models for Mineral Processing Plants. It was reviewed by The Metallurgical Society of CIM and published in CIM Bulletin of September 1991. On September 28, 1989 my son and I submitted for review our take on Precision Estimates for Ore Reserves. Here’s what I wrote to the Editor of CIM Publications, “The authors believe that their methodology provides a reliable measure for the risk to encounter less than the predicted grade”. What had troubled Professor Dr Michel David was that we had not only applied “our own method” but had also failed to refer to twenty years of geostatistical literature. Professor Dr A J Sinclair, PEng, PGeo was troubled because he deemed the variance of a general function a bit dated. He has been teaching generations of UBC students all he knows about geostatistics. What I taught at UBC on November 22-24, 1989 was Sampling Precious Metal Deposits: Metrology – A New Look. Professor Dr A J Sinclair, PEng, PGeo welcomed the participants in Room 330A at 8:30AM. He didn’t object to anything I taught nor did he ask any questions. Yet, he had earlier reviewed for CIM Bulletin our take on Precision Estimates for Ore Reserves. His review was dated November 15, 1989. Surely, Emeritus Professor Dr Alastair J Sinclair, PEng, PGeo ought to explain how Gemcom software converted bogus grades and barren rock into Bre-X’s phantom gold resource. APEGBC ought to get a copy whenever UBC’s Emeritus Professor explains why the distance-weighted average lost its variance! Professional designations are powerful symbols. The public at large tends to trust those who qualify. Noblesse oblige, bien sur! Here’s what the public ought to know! The current code of ethics does not always protect the public at large. I was aware of this code long before I read the Vancouver Sun of March 1, 2012. Much of it is posted under Correspondence on my website. The National Engineering and Geoscience Month (NEGM) was this year held in Vancouver, BC. Its members have as strong a need to be appreciated and understood as I do! But far too few of its members remember as well as I do how geostatistics converted Bre-X’s bogus grades and Busang’s barren rock into a massive phantom gold resource. Kilborn Engineering Pacific Ltd cooked up Bre-X’s phantom gold resource here in Vancouver, BC. I had given my short course on sampling and statistics at Kilborn’s Office long before Bre-X Minerals got into drilling holes at its gold property in Borneo, Indonesia. It bothered but few professionals that geostatistics as Kilborn knew it in the 1990s morphed into stochastic mine planning at McGill University in 2010s. Among those who couldn’t care less whether or not functions have variances is UBC Emeritus Professor Dr Alastair J Sinclair, PEng. He took a liking to Matheron’s thinking in the 1970s. He has been teaching Matheronian geostatistics to scores of students at the University of British Columbia. Since the 1990s I have explained in rich detail on my website and in my blogs why geostatistics is a scientific fraud. Why then do so many APEG Members still ignore one-to-one correspondence between functions and variances? One would expect that sort of scientific fraud to be at variance with APEG’s Code of Ethics. What I want to know most of all is whether or not the properties of variances have ever been a matter of any concern to APEG’s Members. So I tend to ask a lot of questions. Where have degrees of freedom gone? Who lost the Central Limit Theorem? What has happened to unbiased confidence limits for masses of contained metals? Emeritus Professor Dr Alastair J Sinclair, PEng, PGeo rejects one-to-one correspondence between functions and variances. He is still teaching his students all about assuming spatial dependence between measured values in ordered sets, interpolating by kriging, smoothing to perfection, and rigging the rules of applied statistics with impunity. “The Vancouver Sun article you refer to was placed by our sister organization, the Association of Professional Engineers and Geoscientists of British Columbia, but its content applies equally to the practice of geosciences anywhere in Canada as we pledge a common code of ethics and we all play by the same rules of conduct. You are quite right in saying that geologists and geoscientists in Alberta are bound to use only techniques and software that the practitioner is completely familiar with and understands. That is a fundamental rule of professional practice. Further, Alberta geoscientists are mostly industrial practitioners who are pretty pragmatic about what kind of methods they use in exploring for oil, gas and minerals. If a particular body of knowledge or set of techniques or algorithms don’t find dollars, their ultimate objective, they are not going to use those techniques. The Editor in Chief of the PEG wrote: “This is not a debate we’ll get into, for at least three reasons. First, the subject matter is not part of our mandate as a non-technical publication. Second, the complexity of the subject and the need to present both sides, in fairness to UBC and Dr Sinclair, would require a full story, which we don’t have the space or the mandate for. And finally, it’s set in B.C. – our focus is Alberta. Sorry we can’t help you. All the best”. Sound statistics or goofy geostatistics? It took a while to post on my website much of what I know about sampling and applied statistics in mineral exploration, mining, mineral processing, smelting and refining. My webmaster and I have done so in the format of downloadable PDF files. Cash flow is used to derive unbiased confidence limits for content and grade of a reserve, and of the proven part of a resource. The Canadian Institute of Mining, Metallurgy and Petroleum in 2006 made me a Life Member. I am the most irate Life Member of that iconic institution. Every year CIMMP asks its Life Members for donations. It wants to teach students all about mineral exploration, mining, mineral processing, smelting and refining. Sounds familiar, doesn’t it! But I have never donated a penny. Not as long as UBC’s Emeritus Professor Dr Alastair J Sinclair, PEng, PGeo is teaching students to assume spatial dependence between measured values in ordered sets. Why doesn’t he grasp that each distance-weighted average does have its own variance? Did he ever peruse Clark’s 1979 Practical Geostatistics? 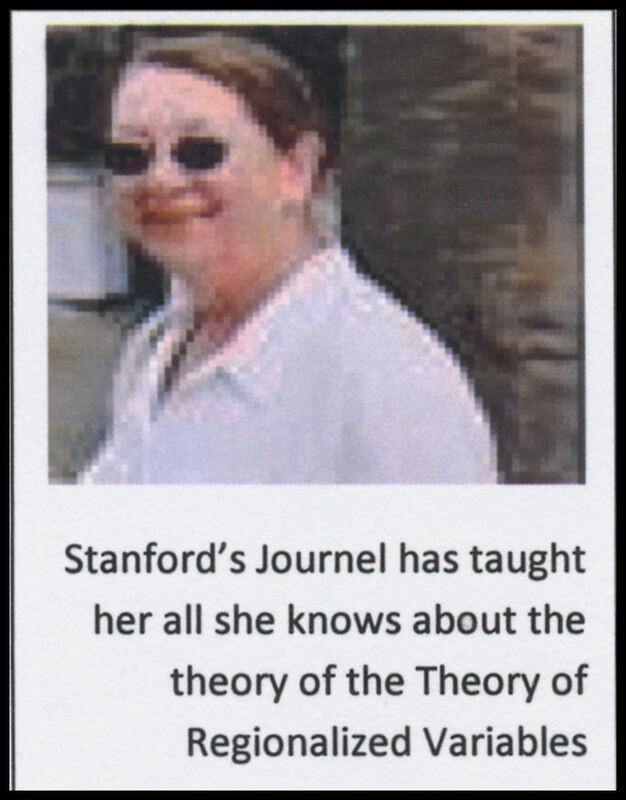 She derived the variance of her distance-weighted average hypothetical uranium concentration. Alas, what she didn’t do was test for spatial dependence between measured values in her wacky sample space. So it seems that Clark’s take on applied statistics is imperfect. The odd mining mogul claims to pine for moral integrity but I pine for scientific integrity. Scores of scientists pay attention to my take on geostatistics. On November 14, 1990 I mailed the first of several letters to Professor Dr Robert Ehrlich, Editor of the Journal of Mathematical Geology. I did so by snail mail and enclosed copies of Precision Estimates for Ore Reserves and of Sampling and Weighing of Bulk Solids. On October 26, 1992 JMG’s Editor wrote, “Your feeling that geostatistics is invalid might be correct”. Attached to his letter was what Stanford’s Professor Dr A G Journel had written “a bit reluctantly”. I have posted this letter on my website under Correspondence. It seemed to Journel that “my anger arises fro a misreading of geostatistical theory, or a reading too encumbered by classical “Fischerian” statistics”. “The very reason for geostatistics or spatial statistics in general is the acceptance (a decision rather) that spatially distributed data should be considered a priori as dependent one to another, unless proven otherwise. It is that spatial dependence which allows differentiated local interpolation and mapping in general. Were the data independent one from another then only global statistics can be retrieved. In presence of dependence the classical notion of degrees of freedom vanishes; n spatially dependent data do not provide n degrees of freedom”. The next stunning farce was Geostatistics for the Next Century. Geostatisticians from far and wide had flocked to McGill, Montreal, Canada on June 3 to 5, 1993. They had come to honor Professor Dr Michel David for his contribution to Matheron’s new science of geostatistics. I tried to get on the program but my paper on The Properties of Variances didn’t arouse any interest. Shortly, I’ll post what I did, what I tried to do next, and what the Master of Ceremony didn’t do! Way too many years I have been exposed to geostat drivel. It has made me a perfect cynic. But I do have friends. A true friend is a precious gift. Sometimes it’s tough to find out who your true friends are. Dr.-Ing Reinhard Wohlbier is a true friend. Trans Tech Publications in 1985 printed my textbook on Sampling and Weighing of Bulk Solids. Thanks to Reinhard it has now been posted on my website as a PDF file. Various papers that I have put together for Trans Tech Publications through the years are about to be posted on my website. Reinhard has formidable knowledge of the handling of materials in bulk. I wish Reinhard and Ute well. Todd Higden, too, is a true friend. He is Creative Director of Frontline Multimedia. He has set up most of my first take on Geostatscam.com. My website went online in September 2005. Todd has posted scores of downloadable PDF files in 2012. It takes less than ten minutes at legal speed to drive to Todd’s Office. I have more papers to scan and post on my website. What I want my readers to know most of all is the difference between sound statistics and goofy geostatistics. Todd does not need to know much about either but he’ll get to know a little! My partner for life and my son are far more than true friends. Hennie has never been awarded a PhD in Psychology for putting up with her driven hubby. In contrast, Ed was awarded a PhD in Computing Science at Simon Fraser University in 1992. He was also awarded the Dean’s Medal in 1986 and in 1992. My son and I did put together Precision Estimates for Ore Reserves. It was thrashed by our geostatistical peers at CIM Bulletin. In spite of that Erzmetall praised it for “splendid preparation” and published it in October 1991. We have also put together Precision and Bias for Mass Measurement Techniques. ISO did like it. In fact, ISO liked it so much that it became ISO 12745:2008. ISO has yet to pay a royalty. Nowadays my son leads the top-level Eclipse Modeling Project as well as the Eclipse Modeling Framework subproject. He has put on the same page his blog, my blog and the bulk-online blog. Now that’s cool!